Please let me explain that I think the answer is no. We are not a Christian nation. It is probably the only thing on which the man at our nation’s helm and I agree. 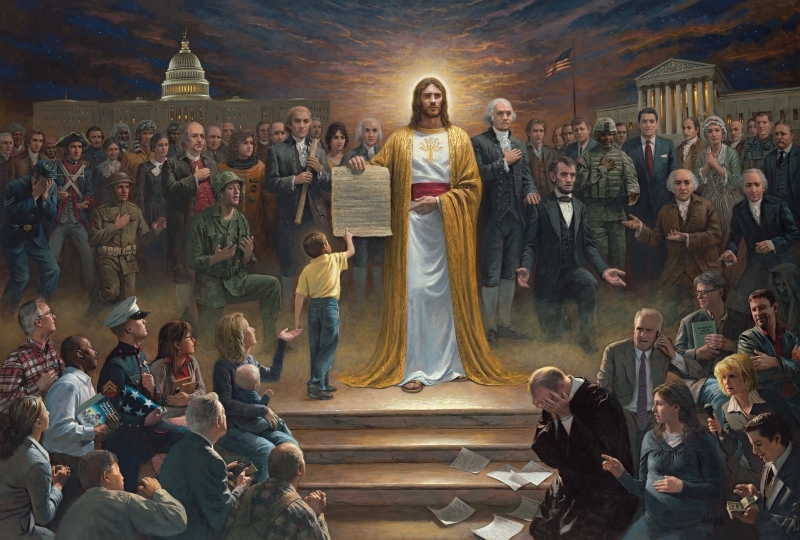 First, I must make it clear that I am not in agreement with the “Replacementists” or the “Dominionists.” I do not think that God’s kingdom came to earth when the Christian Europeans came to America to form this nation. Many have the view called Replacement Theology. I also do not think that Christians will rule the earth before Jesus returns. This “Dominion” thought is not as popular as “Replacement” thought, but it is “catching on.” I think this is an important opening statement because many give man too much credit. I think I know why Barack Obama says that America is not a Christian nation. He says it because he wants it not to be. As you will see, Mr. Obama and I have different reasons for the same conclusion. Barack Obama wants America to be inclusive of all religions and creeds. He has claimed to be a Christian himself, but he does not want Christianity mixed, in any form, with the dealings of the state. There is only one other former president who, while in office, held this view. He came from Arkansas. It is a painful proposition. It is painful to know that the man who wrote our Declaration of Independence wrote his own Bible. Mr. Jefferson didn’t believe in the miracles in scripture, so he put together a Bible that didn’t include them. It is not only the height of arrogance; those who know what the Word says about “adding to or taking away” can see the man’s gross error. While the topic of Mr. Jefferson is at the fore, if you can find the term “separation of church and state” in the Constitution you will have done what no man has done before. If you can prove that the intent of the religion clause meant a separation, I will be changed. In 2010, most Americans believe in the separation of church and state. A relatively new thing is meant by this. A good majority of Americans now believe that Christian principles no longer apply to governance. God’s law no longer applies to our public lives. We are now a tolerant nation. Christians are to love all. Because of this, Christianity is considered by some to be a “tolerant” belief system in today’s religious environment. Psalm 11 puts the truth in plain view . The Old Testament version of righteousness is outlined in the first Psalm. The righteous man is one who delights in the Law of the Lord. A quick check for the word “righteousness” using Bible Gateway (Google Bible Gateway sometime), shows 300 references to the term. Bible Gateway is by no means exhaustive. All who have done a little digging should be aware of the importance of righteousness in God’s eyes. There are certain things the righteous cannot tolerate. Those “certain things” are very important to the faithful. They are important because they are important to God. Does That Banner Yet Wave? This entry was posted on Thursday, July 1st, 2010 at 6:18 AM and is filed under Commentary. You can follow any responses to this entry through the RSS 2.0 feed. You can leave a response, or trackback from your own site.